It is always a good idea to read articles about slot strategies, tips, myths and what to do and what not to do when playing online slots or other casino games. Our selection of articles below will help you make the most of your bank roll when playing at online casinos. 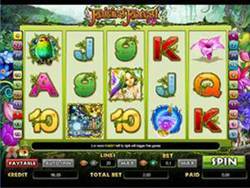 Fairies Forest Slot is a 5 reel, 20 payline slot game. It contains a free games feature, and an expanding wild fairy. The free games feature will be triggered when 3 or more scattered forest symbols show up on the screen from left to right. 12 Free games will be awarded, during which all wins with the Fairy will be multiplied by 5. The Joy of Multiplayer Slots: Sure multiplayer slots are fun because you get to play with your friends. But what hasn't crossed your mind yet is that you can enjoy multiplayer slots playing online slots. Love Board Games? There are so many different bored games you can try online and, far from being boring, these online board games are hugely popular, great fun, and even offer the chance to win cash prizes! You don’t get that playing Snakes and Ladders with your Grandma now do you? Is it Possible to win at Online Slots? : The instant you decide to play online slots you save transport and food money compared to going to a nearby casino. Online slots also save you the hassle of having to deal with the crowds of people at the casino. Online Slots vs Traditional Slots: Online slots are a far cry from the traditional one arm bandit that was first invented by Charles Fey sometime around 1890. How to Win at Slots: The Do's and Dont's of playing slot machines. How to make the most of your bank roll. How to Win a Progressive Slots Jackpot: Read how to increase your chances of winning a slots progressive jackpot. Slots Myths and Realities: There are many superstitions and misconceptions about how and when slot machines will pay out. We examine the most common myths and realities. Slots Money Management: Whether you prefer online gambling or live casinos when you play slots, you want to make sure your money will last. Read our tips for managing your money when playing slots. Slots Tips: Ideas for making the most of your online slots experience. Frequency versus Payout: There are two main factors in slot machines that determine the probability of winning. They are called frequency and payback. Read our article to learn more. Online Bingo: For those of you who prefer a flutter on bingo instead of slots - we have written an article about online bingo especially for you. Variety is the Spice of Casino Life: The most important advice for anyone who is solely playing to make money at casino games is to choose the ones you are most successful at.